It’s not enough to find, clean and display trivets; it’s also important to learn all we can about them. Are they old or new? How and where were they made? Is there a history behind the design? What was their intended use? Under the Reference Library tab I provide various sources of information on trivets; these are all in my personal library. But my favorite reference has always been the “Blue Book” ~ A Collector’s Guide to Trivets & Stands (1990). This book is an absolute necessity for every trivet collector! It was the result of a ten year collaboration between the late graphic design educator, historian and collector Rob Roy Kelly and retired Arizona antique dealer and trivet collector James Ellwood. 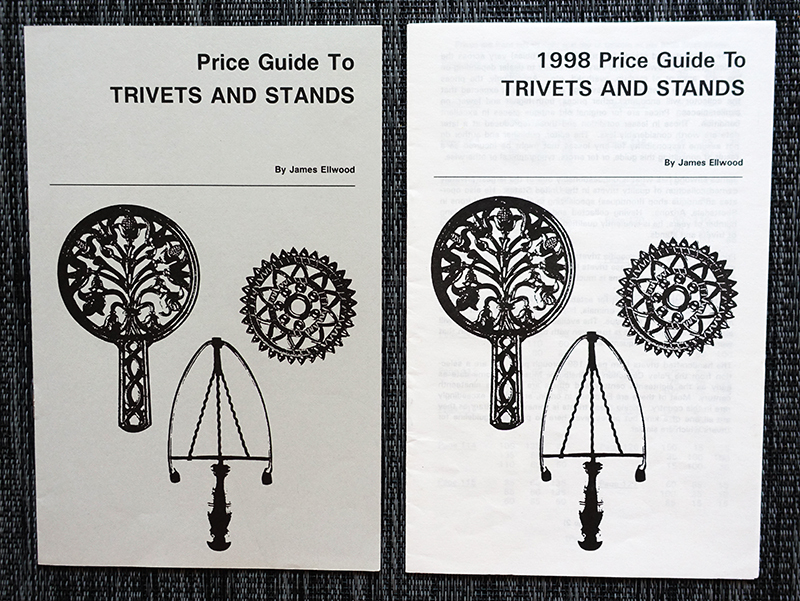 Trivets & Stands continues to be the most comprehensive reference work on trivets and sad iron stands ever written. Over 1300 trivets and stands are illustrated! What’s to be found within the covers of this hardbound book? ● A discussion of ironmaking in Colonial America. ● Methods and techniques of casting and finishing trivets. ● Makers and distributors, product descriptions and stock numbers. ● Trivet designs and their evolution through time. 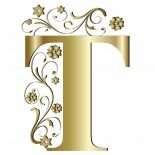 ● Information you need to know to determine the age of a trivet. ● A catalog section (pages 97-254) which is both extensive and user friendly.Most pages present nine trivets, organized by category and function. The book is illustrated in black and white throughout with the exception of some of the brass and ceramic tile trivets, which are in color. Since values weren’t addressed in the text, James Elwood created an eight page Price Guide. The first guide came with the book in 1990; an update was printed in 1998. Although the prices in both are out of date by today’s standards, they’re helpful in establishing relative value. As for me … I started collecting trivets back in the early 1980s. I’d put my little girl in a stroller, hold onto my young son’s hand, and together we’d hunt for trivets in flea markets and at garage sales. For years a growing collection of commonly found trivets decorated my kitchen wall. Fast forward to 1994, when I received a copy of Trivets & Stands from my husband Ed. This amazing book was just what I had been waiting for, answering many of my questions and introducing new information and concepts. It also acted as a guide to the more unusual or genuinely rare trivets I would yearn for and eventually add to my collection. My daughter MaryKate with some favorite trivets in 1990. I’ve worn out at least 4 copies of the Blue Book in the past 20 years; it always sits on my desk, next to my computer. My current copy is marked with colored Post-it® flags and cryptic entries such as notes, questions, prices realized, and the names of fellow collectors looking for a particular trivet. I refer to it often and always take it with me to auctions and antique shows. This wonderful book continues to educate and inspire me, as I know it will educate and inspire you. The Collector’s Guide to Trivets & Stands is long out of print but copies are still available on Amazon Books or on eBay. This entry was posted on December 1, 2017 by Lynn Rosack in References for Collectors and tagged A Collector's Guide To Trivets & Stands, James Ellwood, Rob Roy Kelly.